Follow along as Landan shows you how to install a Mac Performance cat back exhaust kit on your 96-04 Mustang. Start by lifting the car via a lift or jack and jackstands. Support the cat back about 1 foot from where it connects to the midpipe and support the midpipe as well. If you still have the factory exhaust on your car, cut the tailpipe near the muffler with a sawzall. Loosen and remove the cat back to mid pipe hardware. Using an exhaust hanger removal tool, remove the exhaust hangers and remove the front section of the cat back from the car. Remove the over the axle pipes from the car and inspect the exhaust hangers. Replace if needed. Place an included washer over each included bolt. Start with the front section of the pipe and loosely tighten the hardware. Lubricate the exhaust hanger and install onto the muffler hanger. Position the muffler section over the axle and slide the rubber hanger over the factory rod & loosely tighten the hardware. Position the short pipe into place and loosely tighten the hardware. Depending on your year model, slide the correct tailpipe rod into the tail pipe hanger. Slide one of the included clamps over the tailpipe. Slide the tailpipe onto the short pipe and push it back until you have enough clearance to bring it back onto the tailpipe rod. Gradually tighten all of the hardware and adjust the kit to ensure it is not rubbing against any parts of the car and is centered. Align the exhaust tip and tighten the allen key set screw. Mustang MAC Catback Exhaust System. 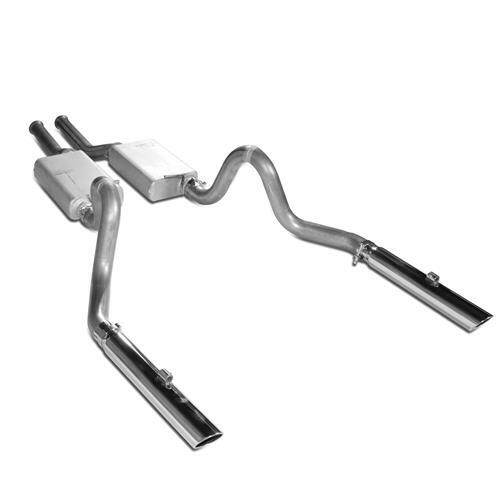 Improve the performance and sound of your 1996-2004 Mustang 4.6L with this MAC catback exhaust system! Factory exhaust is restrictive, quiet, and leaves much to be desired. MAC designed this catback to increase exhaust flow for improved power, sound, and driving experience. The signature sound of MAC's Flow Path mufflers will put a smile on your face every time you take it for a drive! A fully adjustable, and True Fit design allows you to install this kit quickly and easily. MAC has produced exhaust products for over 45 years, and the quality and experience shows in this catback exhaust. Constructed with 2-1/2" aluminized steel, this exhaust tubing features MAC's True Fit design, which eliminates the need for gaskets, muffler clamps, and welding to install. 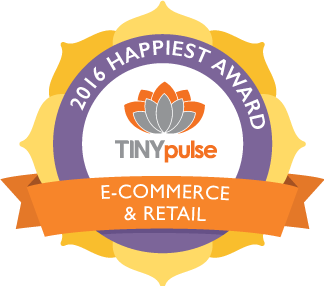 This system will bolt up to stock catalytic, MAC, and most other after market mid-pipes. MAC completes each kit with two 3" or 3.5" rolled stainless steel tips that are sure to look great coming out of your rear bumper! This system comes with MAC's multi passage design Flow Path mufflers that provide years of excellent sounding exhaust! The Flow Path mufflers have no packing material inside to burn up, so you will get the same sound as the first day it was installed even years later. - Will NOT fit 99-04 Cobra w/ IRS. What’s up everybody? Landan with LMR.com! In this video I’ll be checking out MAC Performance’s cat back exhaust kit designed for the SN95 and New Edge Mustangs. MAC has been producing quality exhaust products for more than forty-five years. They are no strangers to quality and experience and this cat back exhaust kit proves just that! This cat back is manufactured from aluminized steel and the mandrel bent piping will measure in at two and a half inches. MAC engineered this cat back to feature their True Fit design which allows for multiple adjustment points. This will help out when installing the cat back and of course aid in properly aligning all of the piping. This system comes with MAC's multi passage design Flow Path mufflers for years of excellent sounding exhaust! The Flow Path mufflers have no packing material inside to burn up, so you will get the same sound as the first day it was installed. The cat back will exit to a nice pair of three inch or three and a half inch rolled stainless steel tips; both options are currently available, and in the box will be all needed piping, tips, and hardware for a straightforward installation. 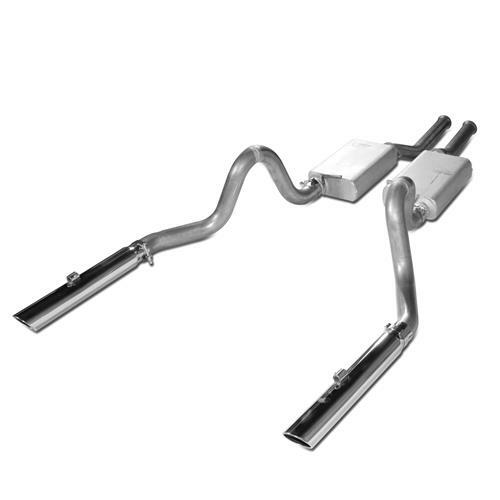 MAC designs this cat back exhaust to fit 1996 to 2004 Mustang GTs, 1996 to 1998 Cobras, and the 2003 to 2004 Mach 1. It will work with the factory mid-pipe or an aftermarket mid-pipe that features factory-like connections. When installing this cat back into your car, I would recommend the assistance from one of your friends. There are multiple pieces to this kit and having the helping hand will only benefit you throughout the entire install. Alright guys, now that I have the MAC cat back installed into this Mustang GT. Let’s check out some sound clips paired up with MAC’s pro chamber mid pipe. What’s not to love about a tried and true MAC Performance exhaust setup? To see more MAC Performance products for the Mustang, be sure and subscribe to our YouTube channel. This MAC Pro Chamber mid-pipe is currently available over at LMR.com! To begin the install, support the car via a lift or jack stands. Support the cat back approximately one foot from where it connects to the mid-pipe. Go ahead and support the mid-pipe as well. If you still have the factory exhaust on the car, use a Sawzall and cut the piping near the rear of the muffler. Loosen and remove the mid-pipe to cat back hardware. Use an exhaust hanger removal tool and remove the exhaust hangers. Remove the front section of the cat back from the car. Now, go ahead and remove the over the axle pipes from the car. Inspect each rubber hanger and replace if deteriorated. Place a provided washer over each of the provided bolts. Start with the first section of pipe and loosely tighten the hardware. Lubricate the rubber hanger and slide it onto the muffler hanger. Position the muffler section over the axle and slide the rubber hanger over the factory bracket. Next is the short pipe. Position it into place and loosely tighten the hardware. Depending on your model, slide the correct tail pipe rod into the tail pipe hanger. Lubricate the rubber to ease the installation. Slide one of the provided clamps over the tail pipe, and then slide the tail pipe over the short pipe. Push it forward until you have enough clearance to bring it back into the tail pipe hanger. Now, progressively tighten all of the hardware working from the mid-pipe connections back. Make sure the exhaust is not touching the frame rails, control arms, rear brake lines, or gas tank. Ensure that the mid-pipe and cat back are even and slightly angled towards the bottom of the car for proper clearance. Align the tip and then tighten the Allen head set screw. Double check your work, get the car on the ground and you’re all finished.